Indoor rowing championships are oar-some! 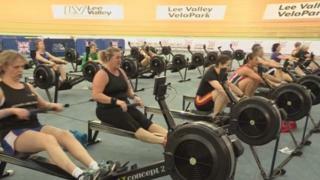 The inaugural British Rowing Indoor Championships took place recently at the Lee Valley VeloPark in London, with thousands of competitors and spectators enjoying the action . It was a mixture of serious competition and fun, with races for all ages ranging from Year 7 schoolchildren to the over 65's. The oldest competitor is 86 and loving it! For those who entered the team competition there was the chance to row alongside Olympians from the GB Rowing Team, including gold medallist Katherine Grainger. To find out more about how to get into rowing, read our special guide.